The Alaska SeaLife Center rescued a stranded male beluga whale calf from Bristol Bay on Monday, June 18. The solitary animal, estimated at two to three days old, was found near the Diamond O Cannery in Naknek. The calf was first spotted after a large storm, and no other beluga whales were observed in the immediate vicinity. The animal repeatedly returned to shore after being encouraged to return to the open ocean. It was picked up after rescuers called the Alaska SeaLife Center, who received authorization from the National Oceanic and Atmospheric Administration (NOAA) to attempt a rescue. With support from Georgia Aquarium, three Alaska SeaLife Center staff flew on a Grant Aviation aircraft from Seward to South Naknek airport to retrieve the calf. “Grant Aviation delayed scheduled flights to enable this rescue to occur, and we thank them for their fast response and accommodation to the special needs of transporting a beluga whale,” said Tim Lebling, stranding coordinator. While the Center was designed with pools capable of holding belugas, this calf is the first beluga whale to ever be housed at the Alaska SeaLife Center. When the 5-foot long calf was brought to the Center, it weighed 50 kilograms (110 pounds). The calf is currently being fed every two hours with a milk matrix created specifically for beluga calves, which contains all of the nutrients and calories the calf needs to grow. “The calf is swimming on his own, cooperating with feedings, and breathing regularly, which are all very positive signs. However, there are tremendous hurdles ahead. Because this animal is extremely young, it is at a very high risk of complications,” said Dr. Carrie Goertz, staff veterinarian. Beluga whales exist in five distinct stocks in Alaska. This calf is from the Bristol Bay stock, a population that appears to be growing and is geographically distinct from the endangered Cook Inlet beluga whale stock. The Alaska SeaLife Center is the only permanent marine rehabilitation center in Alaska, responding to stranded wildlife such as sea otters, harbor seals, and whales. The stranding program responds to beluga whales with the authorization of NOAA. Once a stranded marine mammal is admitted to the ASLC, it receives care from our experienced and dedicated veterinary and animal care staff. 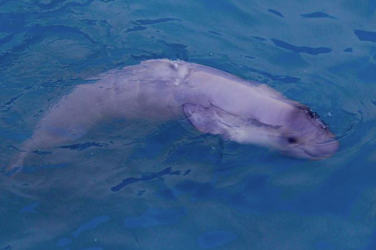 Federal and state funding sources are insufficient to maintain the stranding program at ASLC. “We rely on donations and private grants to enable us to respond to stranded animals like this beluga whale calf. We especially thank Shell Exploration and Production, as well as ConocoPhillips Alaska, for their generous contributions to the Center in support of wildlife rescue,” said Tara Riemer Jones, president and CEO. The Alaska SeaLife Center operates a 24-hour hotline for the public to report stranded marine mammals or birds, and encourages people who have found a stranded or sick marine animal to avoid touching or approaching the animal; instead, those individuals should call 1-888-774-SEAL (7325).